One of the most difficult commands in the Bible for some wives is "submit unto your own husbands as unto the Lord." For many wives this creates "a double fear with terror" concerning what their husbands might do. On the contrary, the only way a wife has to make her husband a good "head of their home" instead of a bad one is for her to use the incredibly powerful tool of submission. The power to change her whole attitude toward life. The power to protect her from her husband's foolish decisions. The power to grow her spiritually. 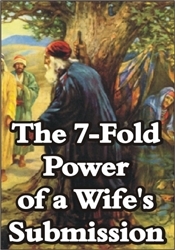 The power to make her husband what God intends him to be. The power to influence him to do good or evil. The power to protect her husband's vulnerable back. The power to change her husband.